People often comment on how beautifully Emma turns the horses out for events, as well as how perfect her plaits are, regardless of the mane length and shape of the horse’s neck. 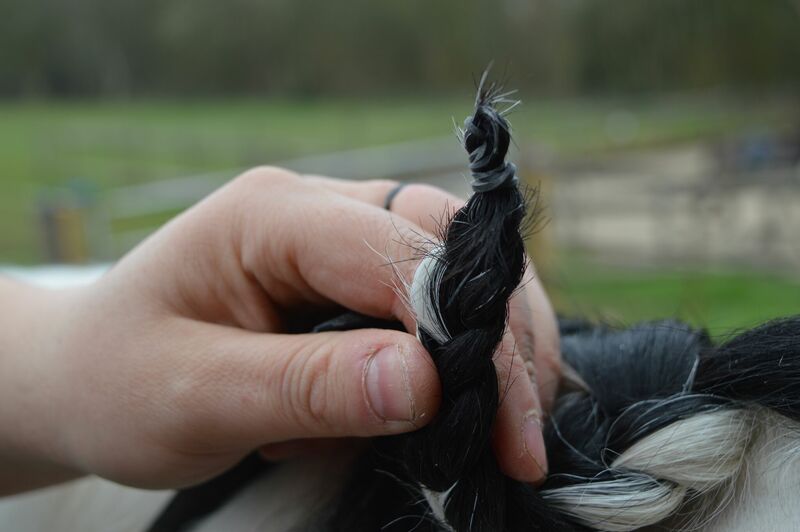 So we thought we would offer some top tips and helpful advice for “How To” create perfect plaits and further develop your plaiting skills. This is part two of our mini series, part one “A Masterclass for Perfect Plaits” can be found here. The secret is in the preparations, there are some essential pieces of kit you will need before you start. 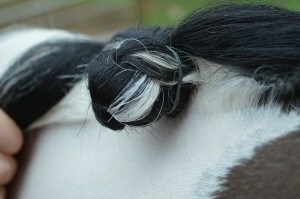 These require you to divide the mane into small equal sections, depending on how small you want to mane sections to be. Some people like as many as 22 but most people will prefer around 14. 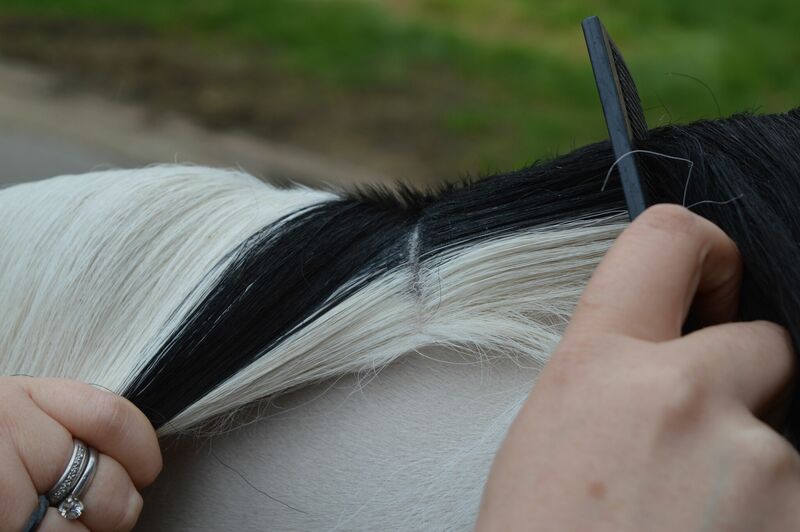 A good trick to ensure that the sections are all completely uniform in size, is to wrap a plaiting band around the end section of the comb which will then act as a spacing guide when dividing the mane into sections. This means that every section will be the same size the whole way down the mane. Start by wetting the mane using the small sponge and divide the mane into equal sections. The comb should be used to ensure a straight line is achieved when dividing the mane into sections, then use the comb to flatten the hair, then divide into three equal sections. To begin plaiting pull the three sections down and plait tightly using your thumb to pull each section as tight as possible all the way down to the end. Once you reach the end of the plait, use the band to wind a round the end of the hair, once in place tuck the end of the plait under, this gives you a smooth, secure end to work with. I don’t roll my plaits when using bands to secure in place, instead I fold my plaits. Lifting the plait up and away from the neck, fold the plait, depending on the length of the mane, will depend on whether you fold the plait in half and then in half again or if you fold the plait into three. However many folds you use to ‘roll’ your plait, you should aim to keep the roll tight and as close to the crest of the neck as possible, once the plait is tight against the neck wind your band around the bottom one third of the plait, wind the band tightly ensuring the elastic strands are all laying flat together. Repeat for the rest of the mane, remember to keep the mane damp, damp mane is easier to work with and helps improve grip. 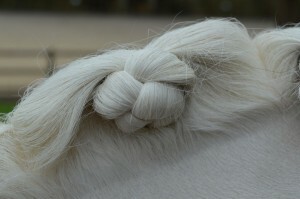 Often people comment on how beautiful Emma turns the horses out for shows, including how perfect Emma’s plaits are, regardless of the mane length and shape of the horse’s neck. 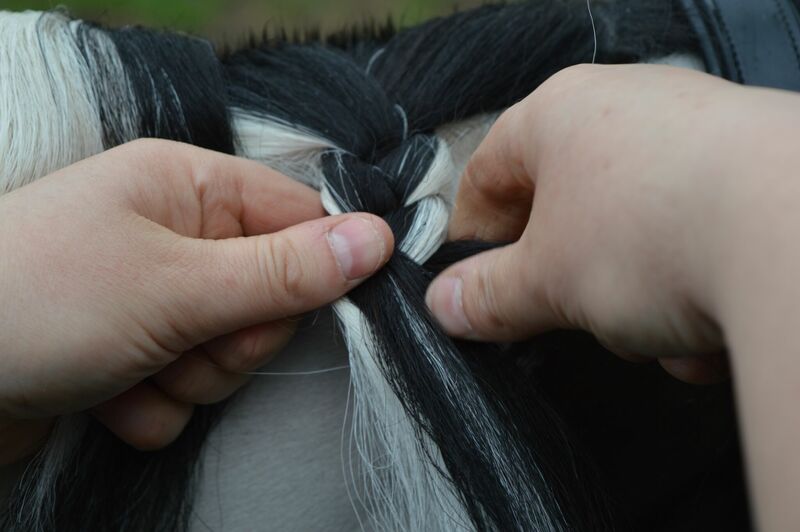 So we thought we would offer some top tips and helpful advice for “How To” create perfect plaits and further develop your plaiting skills. This is part one to our mini series. Some people like to use a plaiting belt to keep plaiting bands, thread and scissors in. 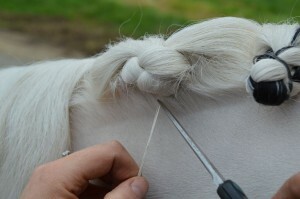 These require you to sew into place and you will need the mane to be left long and all one length. Before you begin plaiting thread your needle with a single thread but ensure you leave a reasonable end on it. 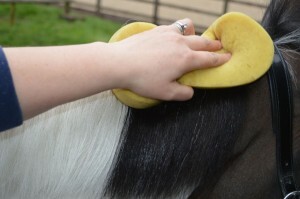 Start by wetting the mane using the small sponge and divide the mane into sections. Unlike traditional eventing plaits, which are completely uniform in size, rose plaits work best by a crescendo effect with the plaits getting wider to the centre of the neck and crest and reducing in size towards the poll and wither. 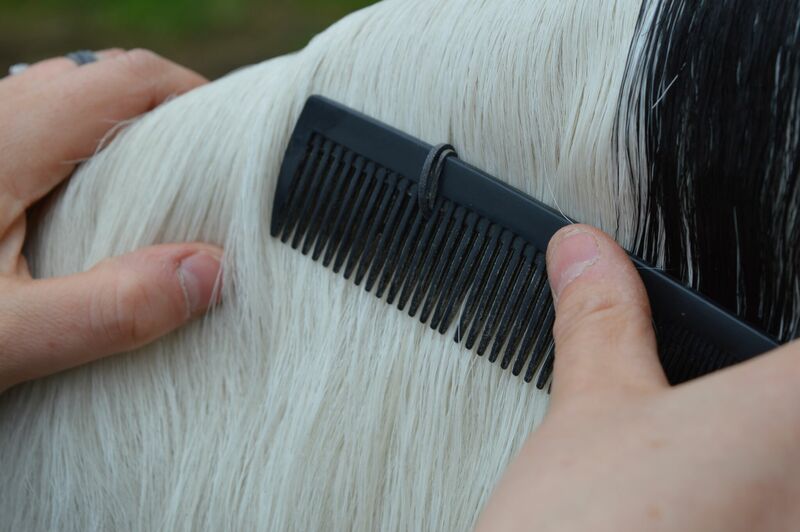 Use the teeth on the comb to act as a gauge to ensure the section is larger or smaller than the previous plait as required.The comb should be used to ensure a straight line is achieved when dividing the mane into sections, then use the comb to flatten the hair, then divide into three equal sections. 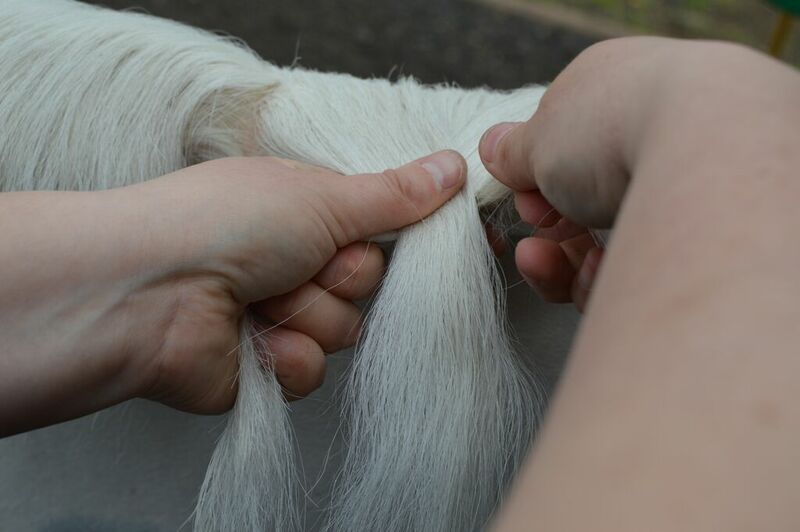 To begin plaiting lift the three sections up and away from the neck, as you begin to plait do not pull the hair tight until you have done one complete wind. 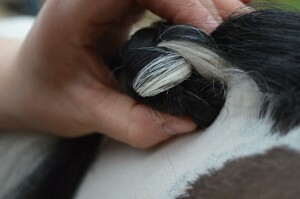 Once you have started the plait, pull the plait as tight as you can down the whole length of the mane. Once you reach the end of the plait, use the band to wind a round the end of the hair, once in place tuck the end of the plait under, this gives you a smooth, secure end to work with. Lifting the plait up and away from the neck, roll the plait tightly in on itself, into a ball, finishing with the plait sitting right on top of the neck. 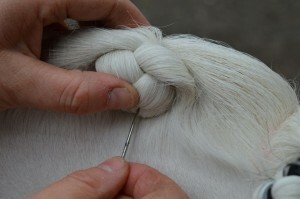 Take the needle and in an upwards motion, pierce the centre of the plait pulling the thread upwards leaving a small tail of thread, around 2cm in length. 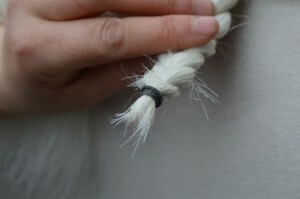 Immediately come back down through the plait, pulling the thread tight and working to reduce the length of the thread. 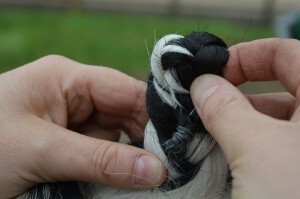 Repeat this several times, you may find you need to go slightly left or slight right of the centre to anchor the plait and ensure it is secure. Make sure the thread is pulled tightly between each thread of the needle.Once the ball is tight and secure, the ends of the thread can simply be trimmed off. 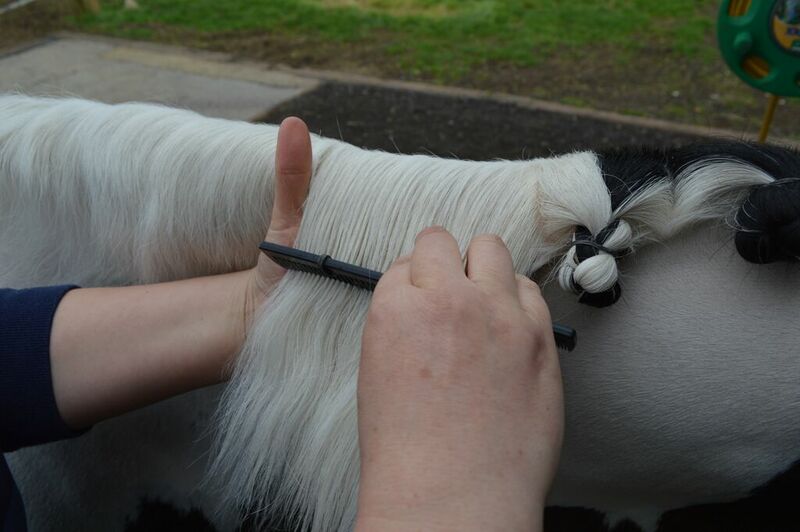 Repeat this process all the way down the neck, remember that the sections of mane should get larger, culmination in the largest section being the central neck plait.